Canada needs to grow greener pot once it becomes legal, says botanist. As marijuana legalization looms, there's a lot for the government to consider in terms of the best ways to handle production. One of those factors should be the crop's carbon footprint, say some advocates. 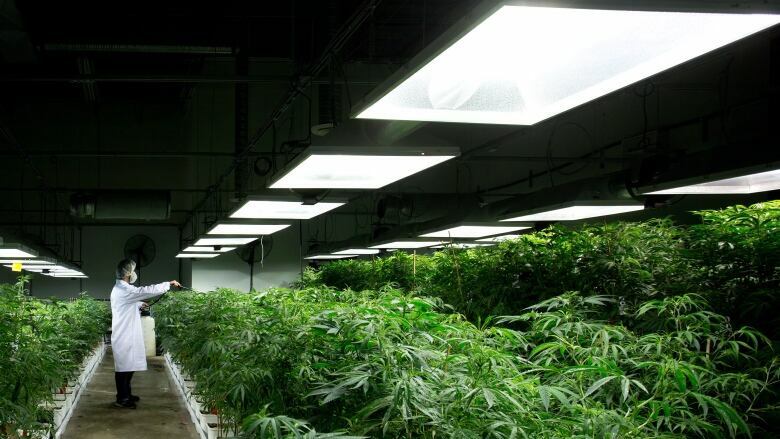 Marijuana plants need a lot of water, and when they're grown indoors under artificial lights, they consume a lot of electricity. A study from 2012 estimated that indoor marijuana production is responsible for about one per cent of all energy consumption in the United States — rising to three per cent in the state of California. Jonathan Page is calling on the government to bring in new regulations to look at pot's environmental impact. He's a botany professor at UBC and the founder and CEO of Anandia Labs, a cannabis biotech company that creates new varieties of marijuana. One of his key suggestions is for the government to encourage outdoor growing to reduce energy and water use — something the government is currently considering in its proposed regulations. "The illicit market is primarily growing indoors, probably under lights in sort of bunker-style systems," Page tells The Current's Friday host Catherine Cullen. "As we transition their infrastructure into a new system, it is an opportunity to get it right, to encourage some of the better practices that would reduce the carbon footprint." The Current: Is bitcoin an environmental hazard? Bruce Linton, the founder, chairman and CEO of Canopy Growth, the largest licensed grower of marijuana in the country, sees practical problems with the idea of growing pot outdoors. "All I could picture is a group of 17-year-olds with drones advocating that fields of cannabis be available for them to find ways to steal," Linton tells Cullen. Page also acknowledges that the quality of pot grown outdoors isn't as good as that grown in greenhouses — that it's more suitable for growing marijuana that will be used as edibles or concentrate. "The outdoor environment doesn't allow the grower to fine tune the environment," says Page. The federal government says it is not planning new regulations to address environmental impacts. However, Linton believes the move toward environmental sustainability will come naturally, without government regulation, because of the cost benefits. "We're trying to migrate from the black market, where it's produced using no consideration for environment," says Linton. "Really what they do is they'll spend as much as they need in a short term cost, meaning bad for environment, lots of power, lots of chemical sprays." The Current: Will legalized marijuana lead to more addictions? He believes that once the business is legal and proper investments can be made, the business case will favour environmental sustainability. "It's one of those occasions where when you exit the black market and enter the regulated market, you can actually use capital to make reliable systems that are better for costs and systems, and better for the environment," says Linton. "You can also use all the skills of engineers and [operate on a] large scale because you're no longer having to hide your production." Listen to the full audio near the top of this page, which includes an interview with Jake Brenner, a professor at Ithaca College, about what Canada can learn from places with marijuana established industries. You can share this episode through email, Facebook, Twitter and other platforms using the icons below. This segment was produced by The Current's Willow Smith and Kristin Nelson.